I was in Charleston a few weeks ago a went out to Sullivans Island... a very pretty place and when the wind is up it's a favored kiteboarding site. There must have been 30 plus kites there the day we visited. The latest rendition of the outrigger attachment... I had rope braces out to the bamboo pole but ended up taking them off. Tried several different paddling positions including standing up... needed a stand up paddle. 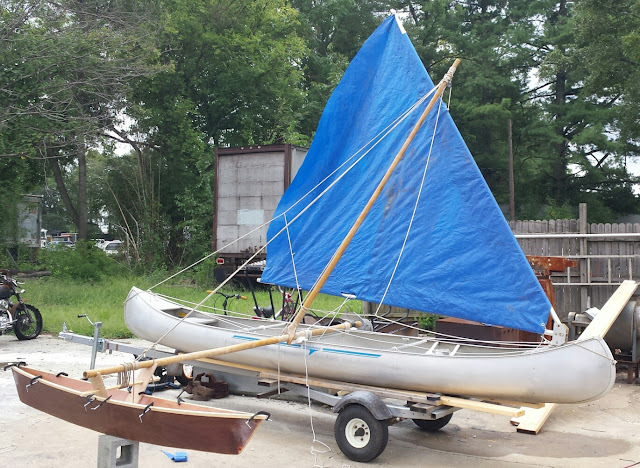 I think I'm going to try a sunfish sail rig complete with the yards... may be a little big but they are cheap... lots of them around and could be easily cut down a little if needed. I had some tubing from an antique hang glider that kinda suited a lateen type rig. The yards were almost as long as the ones on a sunfish rig... thinking that may be the ticket. Trying to come up with a better mount... 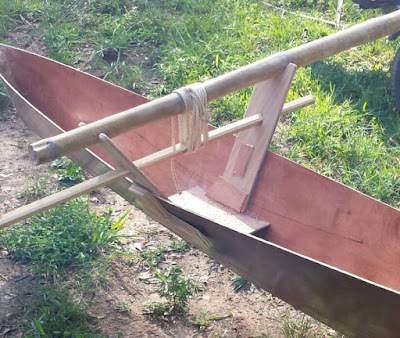 I just had it tied on for a test paddle.... interestingly I could lift the outrigger out of the water just by sitting/leaning to one side in the canoe. For now its just going to be just the one bamboo aka (crossbeam) to support the ama (outrigger hull). I had a serious setback last November..... on the Sunday after Thanksgiving.... I had a fire which burnt my shop and unbelievable amount of stuff with it to the ground. I had just retired and was looking forward to spending a lot of time out there. 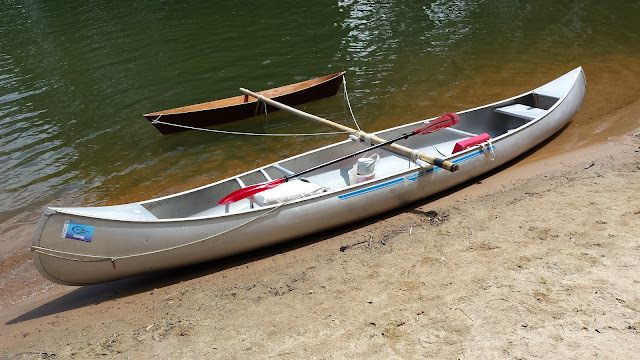 Still recovering from that but just recently acquired a 17 ft Grumman canoe... which I plan... in the near term... to use as a test bed for proa bits and pieces.